Page revised in April 2016. If you came to this page directly, you might wish to read a page on Roman and Medieval Ascoli first. In 1348 the Comune (city state) of Ascoli appointed Galeotto Malatesta chief of its small army. The Malatesta were a family who ruled Rimini until 1500, although the town was formally a papal territory. Galeotto Malatesta strengthened the defence of Ascoli by building a fortress at its eastern end. The fortress was redesigned with the addition of an imposing octagonal keep by Antonio da Sangallo the Younger for Pope Paulus III. 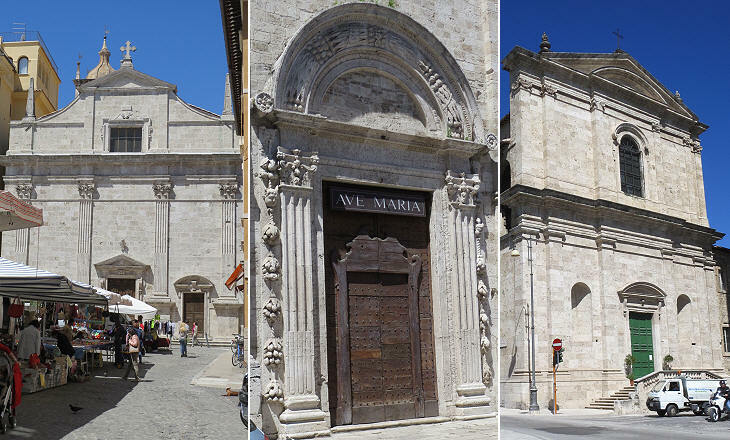 The main Renaissance monuments of Ascoli are situated in its two main piazzas. According to tradition the Bonaparte were a wealthy family of medieval Ascoli who relocated to Tuscany and in the XVIth century to Corsica. The Renaissance palace named after them ought to be called Palazzo Calvi because it was redesigned in 1507 for Francesco Calvi, canon of the Cathedral. 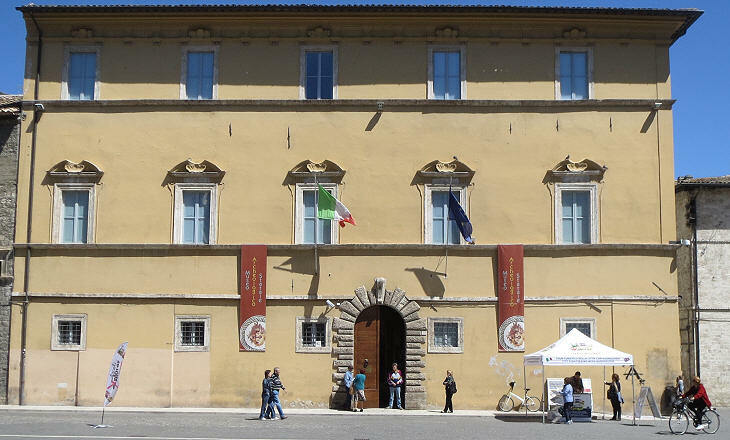 Its windows are similar to those Venetian masons built in Rome for Pope Paulus II and his nephew Cardinal Marco Barbo at Palazzo Venezia and Casa dei Cavalieri di Rodi. The palaces built in the second half of the XVIth century such as Palazzo Malaspina had a plain design in line with patterns made popular in Rome by Florentine architects such as Michelangelo (Palazzo Farnese) and Bartolomeo Ammannati (Palazzo Ruspoli). 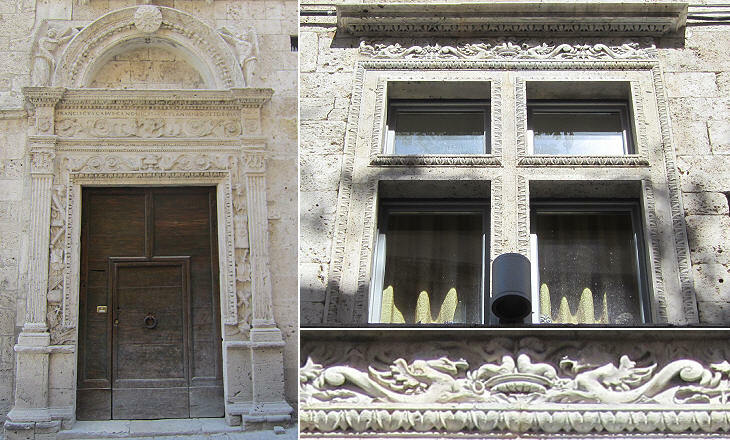 The bugnato portal however has an unusual decoration with theatrical masks (two at the top and two at the sides). You can see the masks at the top which are similar to the ancient ones in the image used as background for this page. 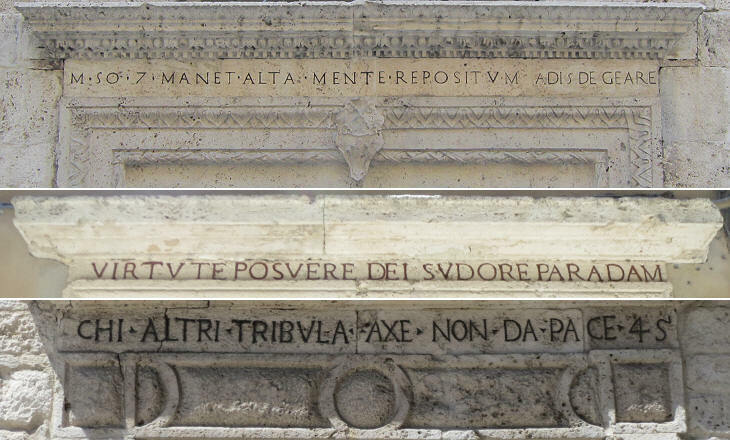 Many Renaissance palaces/houses of Ascoli had inscriptions on the lintels of doors and windows; some of them had a religious content and were written in Latin, others were popular Italian sayings. A characteristic which the churches of Ascoli share with those of Rome is the use of travertine, a white/yellowish limestone which was quarried locally. Several churches of Ascoli including S. Maria della Carità and the façade of the Cathedral were designed by Cola dell'Amatrice, a local architect who was included by Giorgio Vasari in his Lives of the Most Excellent Painters, Sculptors and Architects (Amatrice is a small town along Via Salaria near Ascoli which is renowned for its pasta sauce). Other churches were built in the XVIIth century following plans designed by Roman architects (e.g. S. Maria del Carmine - Carlo Rainaldi). In the second half of the XVIth century in the frame of the Counter-Reformation, the Roman Church recommended emphasizing the role of the ancient martyrs and their heroic sacrifices (you may wish to see some results of this policy). 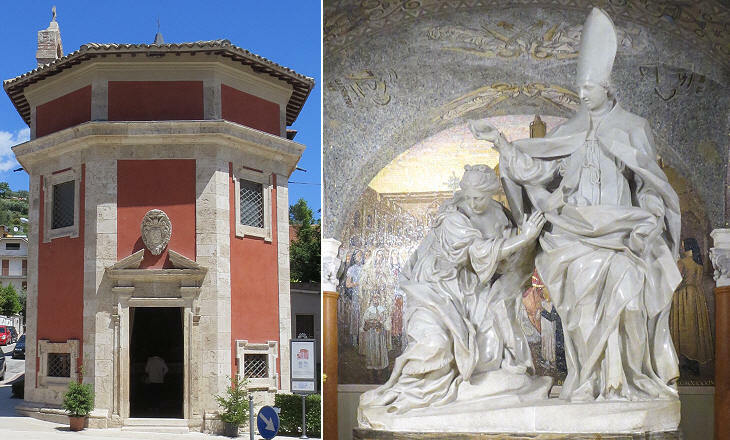 In 1623 a chapel was built at Solestà, the out of town quarter where St. Emidio, patron saint of the town, was beheaded in the early IVth century. It was painted crimson as a reminder of the blood which spilt from the neck of the saint and eventually the building became known as S. Emidio Rosso (Red). In the early XVIIIth century, after an earthquake hit the region around Ascoli, but spared the town, another (very interesting) church was dedicated to the saint at the catacombs where his body had been buried. In addition Giuseppe Giosafatti, the architect of that church, was commissioned a sculpture of St. Emidio which was placed in the crypt of the Cathedral. 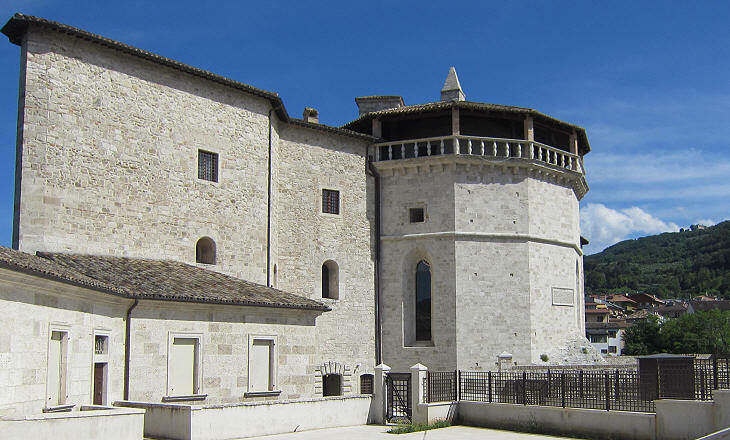 Palazzo Comunale, again by Giosafatti, is the most remarkable XVIIIth century palace of Ascoli. 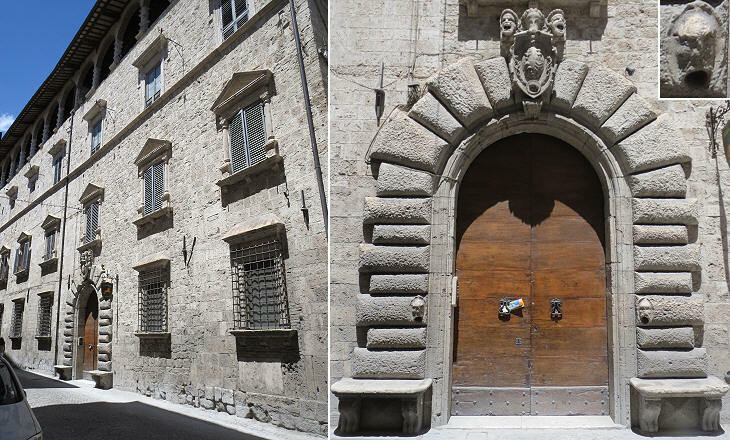 Palazzo Panichi which stands opposite Palazzo Comunale and today houses the Archaeological Museum of Ascoli, is the result of the union of two medieval buildings which were given a rather plain XVIIIth century façade.